So now you have written a BOOK! That’s how all author consultants, advisers, promoters and websites start. A HUGE INDUSTRY! Some are deft predators out to get money from the thin pockets of innocent writers. It’s an industry full of CROOKS and a few genuine operators. The Wise Owl of Good Advice telling you to rewrite, rewrite and persevere! (A left click on the pictures will enlarge most except those taken from internet sources, then click the back space at the top left and you are back in the blog). Even the good ones tell you that finishing a book is BARELY ten percent (10%!) of the writing effort and the rest is “marketing.” You have to get “published”, find an agent to represent you (at 15% royalty), assuming you did all the right things such as having attended reputable writing conferences, learned the “craft” by attending workshops, webinars and reading books, joined a writers group to get feedback on your drafts, and written “the best book you can.” Have your work “edited” by a reputable editor, and write 50 to 100 state-of-the art “Query Letters” (that’s a business by itself). As few authors manage to do all that perfectly but still want to write and publish, they just “self-publish” their stuff and send it to the clouds in e-books. I heard that on Amazon.com some 12 million books are floating in those clouds. Just look at Amazon.com-books and you get the idea. Mostly printed on demand only (POD). I am among those 12 million. Who will find me? That’s the question. Going on the street carrying a board on your back displaying your book? Loading your trunk with copies and stand at a farmers market, yelling “Hey! Buy my book?” Have friends advertising for you? One wonders why everybody wants to write and why some get so desperate. But then, what about American Idol? Everybody wants to sing, too, and only a few get noticed. The law of the jungle. A lot of bad quacking instead of good writing! The friendly-looking Predator Promising You the Moon. Write a book in 30days! Only $237! I will promote you for just $14 K! Go to a bookstore and arrange for a “book signing” hoping that visitors will buy your books with your autograph? I did so recently in Williamsburg in Virginia because my novel Enchanting The Swan starts at the College of William & Mary for the first ten chapters. They wrote an article about it in the Virginia Gazette, even mentioned it on the radio, and I put stickers on W&M boards and had someone announce it on their Law School internal website. I dropped bookmarkers at The Trellis restaurant at the touristic Merchant Square, right at the edge of the W&M campus, with a notice of the book signing the next day. The two main characters have lunch and dinner there from time to time. What more can you do? I traveled to Williamsburg in my Jag XK8 (not earned from book writing! ), cap down, on October 22, in splendid weather. Still summer, folks! I did a rest stop at a Panera near Fredericksburg to pick up some display boards from my charming publisher and designer, Melanie Stephens of Willow Manor Publishing, one of Some Women I have Known, one of Audrey Hepburn who features in it, and one showing the cover of Enchanting the Swan. I made a second “pit”stop at the Williamsburg Information Center, boasted about my books soon to be signed, and received a sticker “Virginia is for Lovers” in return, which I immediately glued to the back of my Jag. Drivers be better aware of my romantic intentions. The lovely girl wanting to read Enchanting The Swan: “True, Are you Dutch? ” Oh my, if I had just been a little bit younger…I would have read it for her at her bedside. It was W&M Home Coming weekend starting October 23 on a beautiful warm day. 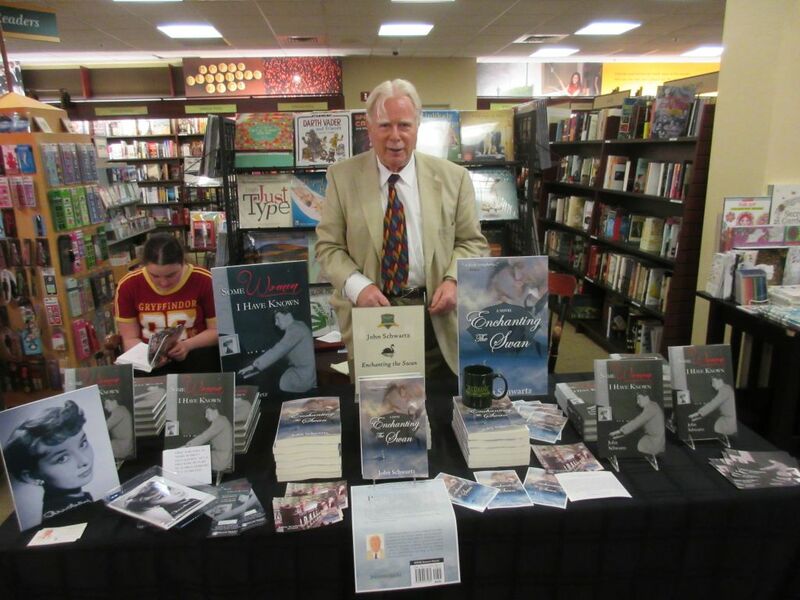 After a quiet but sleepless night at the Williamsburg Lodge, dreaming of throngs of people standing in line for my books, I settled down at a nicely arranged book signing table at the Barnes and Noble/William and Mary Bookstore. The events manager Beau Carr and his charming assistants Eric and Joanna had done a splendid job. I even got a free coffee! So as of 10 AM I waited for the throngs of booklovers to come in. The first was John Lindberg, of the W&M Department of Music at Ewell Hall, the unsurpassed percussionist, so-called “retired” but still in full action, who is one of the memorable characters appearing in Enchanting The Swan. I had promised him a free copy but he insisted on buying it. Then a charming lady appeared who wanted to buy a book for a dear friend, who also appears in the novel, but whose name I can’t mention as I would betray her gift. And then nothing. As the hour went by, shoppers smiled at me but went for the William & Mary T-shirts, not my books! Finally some buyers showed up, chatted and purchased a few copies of Some Women and Swan, getting my handsome autograph wishing them a good read. The last visitor was Deb Boykin, Associate Vice President for Student Affairs (Campus Living) and Director of Residence Life, with whom I had a most productive interview during my research at W&M. That was a worthwhile close of my book signing! All in all, a little over 10 books sold (about 3 books an hour, which seems to be the going rate according to knowledgeable sources). After 4 hours I had to pack up to make room for another author. It was award-winning Wilford Kale! A longtime Williamsburg resident and former Williamsburg bureau chief and senior writer for the Richmond Times-Dispatch, who wrote a magnificent photo book of the History of William & Mary, which I had purchased earlier for my daughter Samantha who studied there. I felt honored to get to know the famous writer. When later in the day I passed by his table, full with W&M and Williamsburg related books, to see how well he was doing, he also complained that everybody went for the W&M T-shirts. Well, if he as an author with much local notoriety did not sell much, I could not feel too sorry for myself. I left with a last look at the Crim Dell Bridge at W&M. After all Virginia is for Lovers! Beau Carr of the W&M Bookstore found that I had a respectable showing, despite the surge on W&M clothing! Some did better, others did not. Then I checked back with Judith Briles of the Author University website (http://authoru.org), my favorite, if book signings are a useful marketing tool and the answer was negative. Personally, I believe that seeking your audience through book clubs and speaking engagements increase your book sales more. All in all, a new adventure. It surely keeps you on your toes!